The Internet of Everything is bringing exciting growth to the digital world. But sometimes that growth can mean latency, bandwidth and security challenges for companies that aren’t prepared. To succeed, you’ll need to be better connected than your competitors. 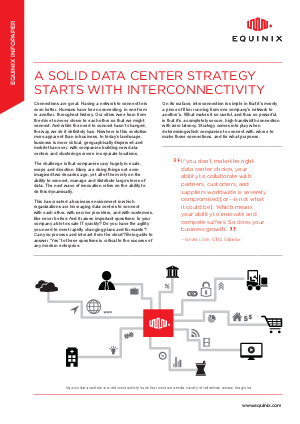 Read our interconnectivity infopaper to find out how tapping into our more than 900 networks and 450 cloud providers can give you secure, high-bandwidth connections with zero latency and ensure your success in the Internet of Everything era.